The Musette: part one – what a pickle! 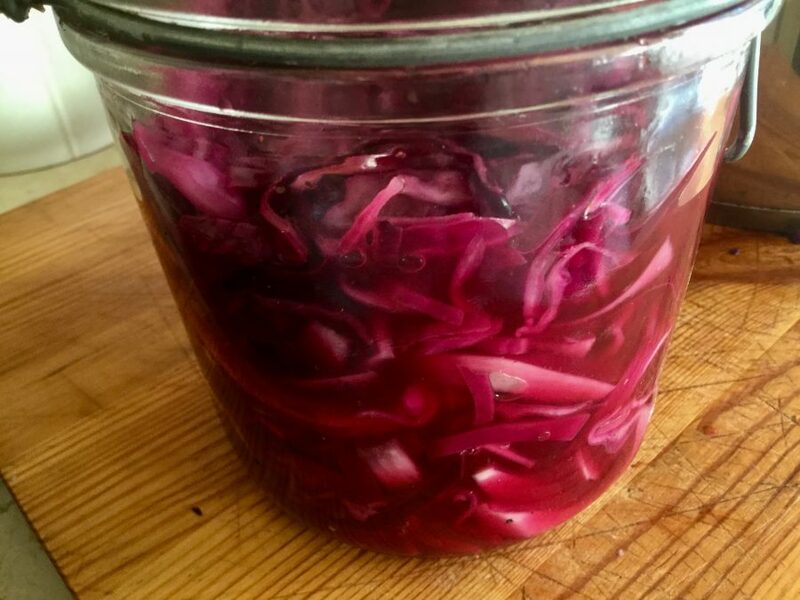 As a child I loathed most pickles, including Branston, though bizarrely I loved my grandmother’s home-made pickled shallots, picallili and pickled red cabbage. 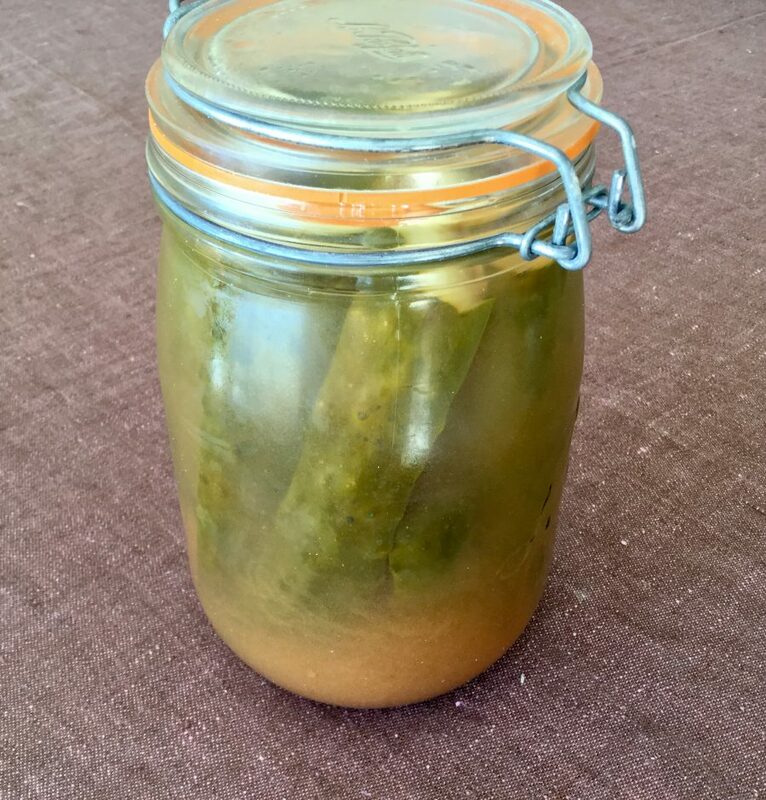 It’s only as I’ve matured that I’ve come to appreciate chutnies and all manner of other pickles – preferably home-made. There is a reason we have pickles, and it is the same reason we crave good art: we are in it for the pleasure … we are in it for the rush of salt, the crunch and satisfaction, that perfect bite. While I’ll happily buy my jars of perfect bites, I enjoy making them, too – although, as much as I like the idea of a fridge filled with rows of jars, I typically only make small batches of preserves. It feels manageable, both in the making and the storing, because if something does go awry then it doesn’t really matter. As a rough guide, 1kg (2lb) vegetables, peeled and cut into bite-size pieces, needs 750ml (3 cups) pickling liquid made by mixing 550ml (2 cups) vinegar (sometimes my home-made vinegar) with 200ml (3/4 – 1 cup) water in a pan, then adding a heaped tablespoon each of fine salt and sugar, and whatever you fancy of the following: a crushed red chilli, peeled or crushed garlic, bay, dill, peppercorns, juniper berries or coriander seeds etc etc Try to pick flavours that will complement the vegetable. Then heat it slowly. Once at boiling point, add all the vegetables, stir, cover the pan and leave on the heat for a minute or two before bottling in sterlised jars. 1. Slice cabbage in half. Slice one half in half again. Remove the core. Shred cabbage finely with a mandolin slicer or very sharp knife. Place in a large glass bowl or jar. 2. Place water, vinegars, salt and sugar in a saucepan and heat gently until the sugar and salt has dissolved. Stir in the spices and then pour over the cabbage. 3. Seal or tightly cover the jar/bowl and let sit on the counter for 3-4 hours. Stir then seal and place in the fridge until chilled (at least 1 hour). 4. At first the liquid will not cover all of the cabbage but as it starts to soften it will be fully covered after just a few hours. Best served at least a day after making. Keeps for about 2 weeks in the fridge – rarely lasts that long! 1. Cut the pickling cucumbers in half lengthways, and slice regular ones through the middle, then into fingers. Peel and finely slice the shallots. 2. Put the cucumbers and shallots in a colander. Sprinkle over 2 teaspoons of sea salt. After 45 minutes, rinse well. 3. Combine all the other ingredients in a pan and bring to the boil. Stir until the sugar dissolves. 4. Fit the cucumbers snugly into a Kilner jar, then pour over the liquid. Seal and leave for at least 24 hours. And that’s pretty much it! 1. Sterilise your preserving jars with boiling water and let them drain, or bake them at a low temperature in the oven for at least 10 minutes. 2. The pickles can be eaten the following day, but they’ll be even better if you wait. I keep my pickles in my preserves fridge. They taste better when cold anyway: brighter somehow, the sweet and sour and taste even more pronounced. Midweek we made several jars of pickled red cabbage, two jars of pickled shallots and one of cauliflower. None of piccalilli as we gave up after many soggy attempts years ago. Tomorrow it’s our own mince squares, not pies, and our homemade mincemeat. A bit messy but compensated for with copious amounts of rum or whisky or whatever we have most of! You’re a couple after my own heart. I still have to make the mincemeat which will also have copious amounts of alcohol, probably rum. I have however made the Xmas cakes. Pickles are the BEST! We have a friend who makes us enough it takes six months for us to get through them. You’re very fortunate! I distribute some of my home-made jam, lemon curd, chocolate hazelnut spread and marmalade because I make them in much larger quantities and there’s a limit to how much we can eat. I do have a few friends who reciprocate but it’s largely one way traffic! I can guarantee you, those friends appreciate the gesture… and your generosity. Sheree, if I were as talented as you in the kitchen I might give your recipes a whirl. They sound terrific. In any case, right now I wouldn’t mind a kosher half sour dill pickle. I grew up with them, among other pickles, but haven’t had one in quite a while. Neil, thanks for the compliment but, honestly, if you can read you can cook or, in this case, pickle! Love anything pickled! Excellent post and thank you!